Authorities have reported that the number of registered mobile phone users in Tibet Autonomous Region has now reached nearly 3 million. The regional communications administration in Tibet has released data which showed that there were 2.92 million registered mobile phone users as of Dec. 2014. Xinhua reported that there were 359,000 landline subscribers in the region based on data released by the communication agency. Mobile phone services in Tibet were launched in 1993 and the government had set up only one station in Lhasa. About a decade ago, mobile phones are seen as a luxury and a status symbol in Tibet. Known as the "roof of the world," the region has an average altitude of more than 4,000 meters, which made it difficult and costly for the government to build telecommunications infrastructure. 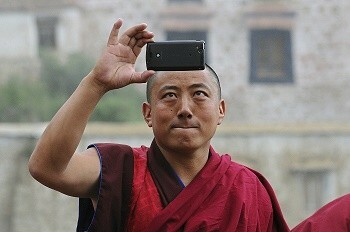 According to the report, many Tibetans now have mobile phones, which have become indispensable to them. For many people, mobile phones are convenient to use and help them connect to the outside world easily. To promote the use of mobile phone and make it easier for people to use them, the local technology and information department as well as technology companies have worked together to develop an operating system, an input method and Web browser in Tibetan language, the report added. According to the government, there are nearly 2.17 million Internet users in Tibet now. Mobile phone and Internet use has helped the Tibetans to connect to the outside world, promote the economy of the region, and give people a bigger view of the world.